Hundreds rally in support of prominent Chicago teachers’ leader Sarah Chambers | Fight Back! 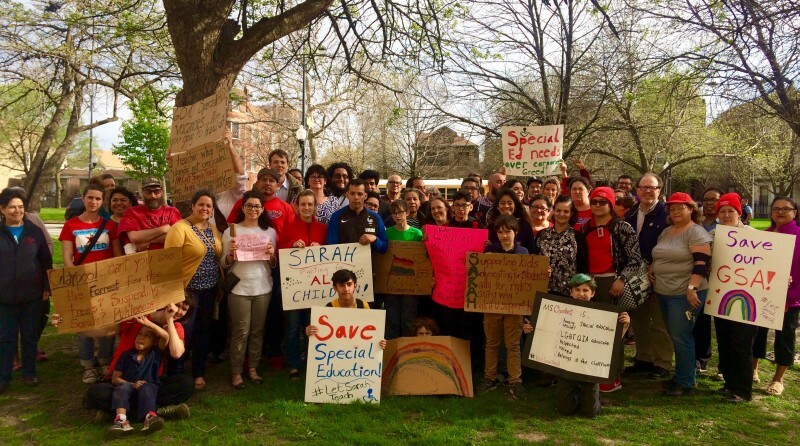 Chicago, IL - Several hundred people gathered on the lawn of Maria Saucedo Academy today, April 18, in an after-school to rally in support of Sarah Chambers, who has been suspended and faces termination. Mayor Rahm Emanuel’s appointed school board is coming after this teacher for her role in the fight to defend the public schools and Special Education. The crowd included students, parents, teachers, Chicago Teachers Union activists, trade unionists from other unions, and groups from the Palestinian and Filipino communities. Cook County Commissioner Chuy Garcia spoke and demanded that Chambers be returned to her students immediately. Rasmea Odeh, the Palestinian community activist persecuted by the U.S. Department of Justice, also came out to show her solidarity.